Rishabh Pant’s video playing with Shikhar Dhawan’s son Zoravar has gone viral on social media, with fans reminding Tim Paine of the manner in which Pant does ‘babysitting’. Indian wicket-keeper batsman Rishabh Pant earned himself the nickname of ‘babysitter’ during India’s tour of Australia where Aussie Test skipper Tim Paine asked him to babysit his children, as a sledge, during the series. The incident became the talk of the town and as Pant was seen playing with teammate Shikhar Dhawan’s son Zoravar during the Indian Premier League (IPL) match between Kolkata Knight Riders (KKR) and Delhi Capitals (DC), the ‘babysitting’ talks went abuzz on social media again. 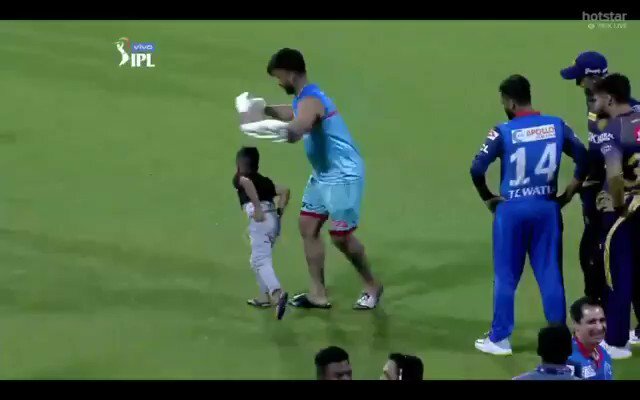 In the video that has been doing the rounds on social media, Pant can be seen playing with Shikhar’s son in a rather wild manner where Zoravar is trying his hard to escape Rishabh’s grip but isn’t quite able to. Many fans on Twitter have tweeted the video tagging Paine, suggesting him to think twice before he offers the babysitter’s role to Pant again. Meanwhile, Dhawan’s unbeaten 63 ball 97 steered the Delhi Capitals to a 7 wicket win over hosts KKR in their own backyard. Rishabh Pant was quite clinical with the bat as well, scoring 46 off 31 to help Delhi hand a second straight defeat to Dinesh Karthik’s men. With this victory, Delhi moved to the fourth spot in the IPL 2019 points table with 4 wins from 7 matches. The visitors also managed to break the jinx of winning a game at the iconic Eden Gardens as they hadn’t managed to register a win at the venue since 2012.